You can’t do business internationally with a low exchange rate: The argument that a country can’t do business if its base currency (the dinar) is only worth a fraction of a U.S. penny is a common but absurd argument. In the modern global economy, the decimal place in an exchange rate doesn’t matter. If it did, how could South Korea, Indonesia, Madagascar, or Vietnam be such large exporters of consumer goods? You don’t need to look farther than the tag on your shirt to confirm that each of these exporters, with currency exchange rates lower than the dinar, don’t have any problems exporting goods. I am often challenged by victims and scammers that investing in the dinar is “just a risk” like any other investment, including stocks. However, saying that the dinar is just a risk like buying stock is like comparing the risk of walking out your front door and walking out the door of an airplane in mid-flight. It is possible that either activity will lead to your death or injury, but one is much, much more likely. Liquidity: There is currently no active market for dinars. You can buy them and sell them through dealers, but the difference between the buy and sell price can be 20% or more. 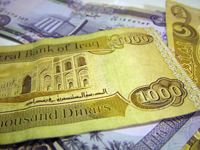 If Iraq redenominates their currency (a common issue with developing economies), then it could be very difficult to exchange those dinar anywhere outside Iraq. Unregistered investment: The dealer/promoters are only operating legally because of a technicality that allows currency dealers to sell hard currency to individuals without having to be a licensed investment advisor or broker/dealer. They hide their real identities behind pseudonyms and can shut down and restart as easily as you can buy an Internet domain. Victims have no recourse if their “investment” goes bad or they were lied to. Inflation: Most developing economies suffer from very high inflation, if not hyper-inflation. Iraq is running a very large fiscal deficit and already has been warned by the IMF that at this rate, the deficit will likely lead to economic problems. If the price for Brent-oil drop much further, they won’t be able to support their economy and inflation (already running very high) will ramp up quickly. For years, I have watched more and more new investors sink money into the Iraqi dinar, then become obsessed with watching for their ship to come in. Many of them wind up not only losing their money, but also their time, marriages and jobs over their obsession with this get-rich-quick scam. Like all investments, if it sounds too good to be true — it is. John Jagerson and Wade Hansen are the editors of SlingShot Trader, helping investors capture options profits trading the news by using a proprietary 100% news-driven trading platform that turns event-driven pricing inefficiencies into fast profits. Get in on the next trade and get 1 free month today. New to options and need more personal guidance – try our online options course: Strategic Investing and receive your first two weeks free by clicking here. Article printed from InvestorPlace Media, https://investorplace.com/2014/06/iraqi-dinar-scam/.